Daniel Adongo is a rugby union forward. He is versatile, equally capable of playing at Lock, flanker or number 8 and even has the pace to play on the wing. He has played in the in the Currie Cup, South Africa’s top domestic league. There fans know him popularly as the man mountain, a reference to his physique. At Six foot seven inches and weighing 112 kg (246 lb), and with the pace of an express train, Adongo is a handful for every opposing defender. He was recently recruited by All Black legend, Tana Umaga to play for Counties Manukau in New Zealand. Adongo attended Strathmore School in Nairobi, Kenya where he started to hone his rugby skills. While there he was recruited to the Kenya Harlequins youth team. He also played for Kenya youth teams. While playing for Nairobi province in the Safari sevens schoolboy contest of 2006, Adongo’s performance put him head and shoulders above all others. It attracted the eyes of talent scouts from South African team, Natal Sharks. In 2007, he moved to South Africa to join the Natal Sharks Junior side. He played for the Sharks U-19 and U-21 teams in the Vodacom cup. In 2011, he played in the Vodacom Currie cup senior tournament. In 2012 he moved to Blue Bulls, a Pretoria based team playing in the Currie Cup. 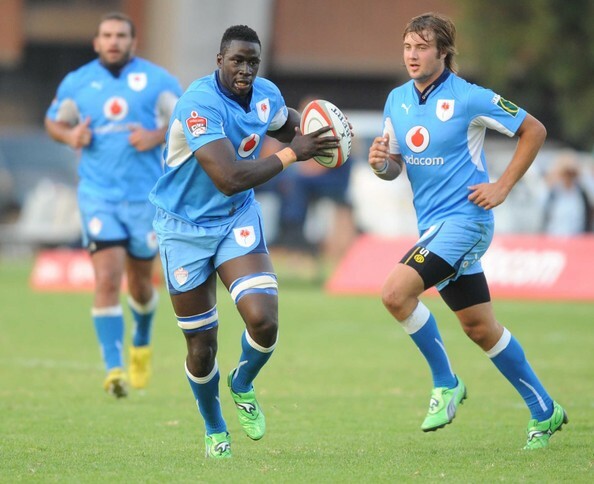 Adongo aimed to play for the South Africa Springboks some day. In July of 2012, he left South Africa to join Counties Manukau of New Zealand. Tana Umaga came to watch him play for the Elgon Warriors and saw enough to convince him to offer Adongo a contract. His elder brother Leon Adongo also played for the Kenya sevens team from 2010 to 2012. After a 12 week stint in New Zealand, Adongo returned to South Africa to play for the Kings in the Super Series. Due to limited playing time, he also played for Tuks in the Varisty Cup. Adongo had been taking classes at Tuks University. On July 25 2013, Adongo made history when he was signed by the Indianapolis Colts of the NFL, (American Football). On December 8 2013, he made his first team debut. This entry was posted in Diaspora Kenyans in sports and tagged Daniel Adongo, Kenya Rugby. Bookmark the permalink. So how’s he doing now. was pretty disappointed when he left the Sharks this year. i love that spirit Adongo,,God bless u.